Over the last eighteen months, I have researched the 226 men from Sevenoaks who fought and died during the First World War and who are named on the town war memorial at The Vine. This was the most extraordinary journey, which started out of curiosity and as the banner photograph shows, culminated in descendants of the men gathering at the memorial for a special service last August on the anniversary of the outbreak of war in 1914. 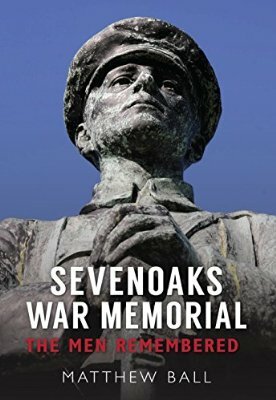 Last November I also published my first book, Sevenoaks Memorial, The Men Remembered (Amberley Books, 2014), which includes entries for 220 of the men and of course names those, such as the elusive D Smith and Walter Davies, that it was hard to find any evidence for. I’m pleased to say that the book sold well on its launch and continues to do so, with all profits being donated to two relevant charities, SSAFA and the Sevenoaks branch of the Royal British Legion. The book is available direct from this site, online or, if you are local, from one of the bookshops in town, including the lovely Sevenoaks Bookshop, who very kindly hosted the book launch on Remembrance Sunday last year. If, like me, you like to support independent bookshops, then this one is well worth a visit, especially as they do great tea and cake too! Although I’ve charted the progress of my research in the Sevenoaks Chronicle, and via Facebook and our twitter feed, I think that it’s time to launch a website. Despite initially wondering how I would write 50,000 words for the book, my problem quickly became one of ‘What do I leave out?’; so there is so much more information still to share, including letters home from the men, photographs that didn’t make it into the book as well as family stories that have been passed on to me. My work also uncovered many other stories from Sevenoaks during the war and I am now researching those men who fought and returned (it was estimated that over 1200 men from the town fought in the war), as well as those who died and are buried locally but not remembered on the memorial (such as flying ace, Group Captain Bernard Paul Beanlands who is buried in the churchyard at St Nicholas). I’m also researching the stories of the women of Sevenoaks. They nursed at one of the local VAD hospitals, worked in munitions factories or knitted clothes for men at the Front. They also had to cope with the loss of their husbands, brothers and sons and it is important that their stories are also told. So, if you have a connection to anyone from Sevenoaks during this time, I would love to hear from you! I hope that this website will be the perfect place to share all of this information and allow the project to become more interactive, not only with the relatives who get in touch, from Tonbridge to Australia but also with today’s residents of Sevenoaks, especially the young people, such as pupils from Combe Bank School, who have already got involved in different ways. I hope you enjoy reading the posts and please do comment,I look forward to hearing from you!